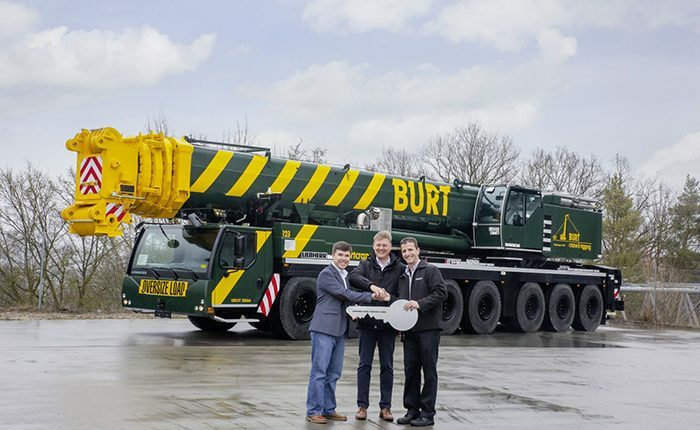 Burt Crane & Rigging, Green Island, N.Y., is adding a Liebherr LTM 1400-7.1 mobile crane to its fleet, and last month COO Thomas Scheib journeyed to Ehingen, Germany, to collect the keys to the crane. Burt Crane is expected to take delivery of the all-terrain crane this month. This crane, which has a lifting capacity of 500 tons, brings the number of Liebherr AT cranes in Burt Crane’s fleet to 14. Scheib journeyed to Liebherr-Werk Ehingen in March to see the factory in operation and “collect the keys” of the LTM 1400-7.1 mobile crane. When the crane arrives on U.S. shores this month, it will be commissioned and go to work in the Albany, N.Y. area in a variety of applications ranging from heavy-lift to industrial and commercial construction. The new acquisition brings Burt’s crane fleet to 23 machines, of which 14 are Liebherr mobile cranes. “Safety, technical innovation, high lifting capacities, and Liebherr’s commitment to customer service were some of the key factors in the decision to add the new crane to the fleet,” said Scheib.